The 3 Toadstools : Halfway to layout city and goodies! 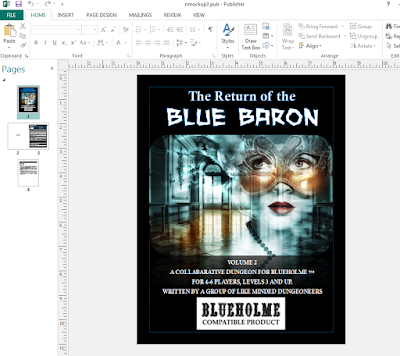 Alright, so we have basically finished editing "the return of the blue baron" ie volume 2. I had originally named it "part deux", but figured that might confuse a few people. Note that there is the Queen's English in the document however, examples include "Armour". In those instances you should know that a Canadian may have written that section. As we were doing some editing we were also doing some last minute writing. I am almost positive that there maybe a few little rewrites happen while I work on the layout. I've sent off a copy to Michael at Dreamscape Design, to basically rules lawyer it. I mean he's the guy who wrote the blueholme rules, so it's our best bet to get it right! I would like to thank Scott Charlton for majorly stepping up to the plate and basically editing more than half of this! As well for coming to the table with a lot of rooms, ideas and the general concept. If it wasn't for him, this would not have been done. at all. Here's a screen shot of the cover. Yesterday, I had a crap day. Then I got home, and I had more crap to deal with. It was just one of those days. I finally walked to the front and opened up the mailbox and to my absolutely surprise, I found a package waiting for me! 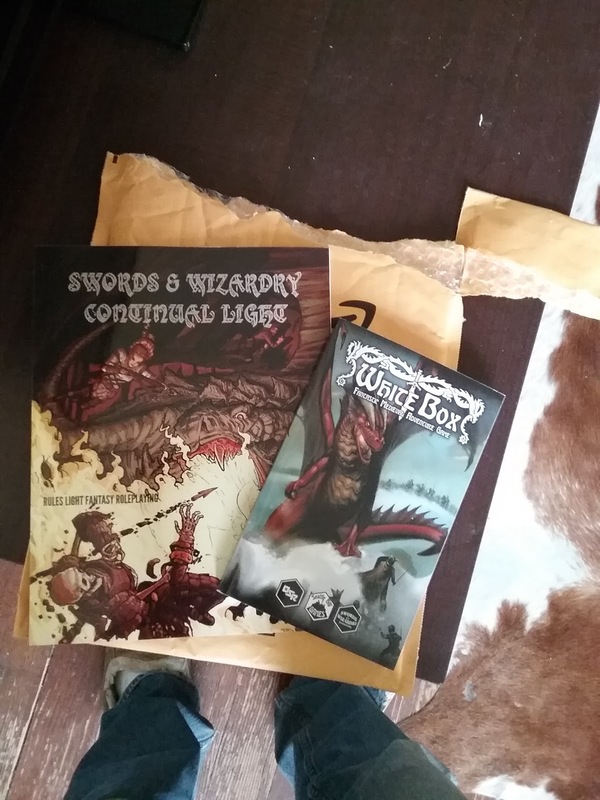 This wonderful person, sent me a copy of Whitebox FMAG and Swords & Wizardry Continual Light! Thank you very much wonderful person! That made my day. I will be doing a review of SWCL in the next week or so. I'm sure both of these books will find room at my table. Thank you again! Labels: blueholme, dreamscape design, Scott Charlton, the return of the blue baron.